BEIJING, China — The White House signaled Tuesday that the latest round of Russia aid to separatists in Ukraine is likely to trigger another round of international sanctions against Russia, but President Barack Obama doesn’t plan to make the issue a focus of international economic summits he’s attending this week in Asia and Australia. President Barack Obama and Russian President Vladimir Putin spoke briefly Monday night before a dinner that was part of the Asia-Pacific Economic Cooperation summit. “We continued to be deeply troubled by Russia’s activities,” Deputy National Security Adviser Ben Rhodes told reporters traveling with Obama. “We’ve seen the continue provision of support to separatists, including heavy weapons, that are in complete violation of the Minsk agreement,” he added, referring to a deal cut in September among Russia, Ukraine and two separatist groups. 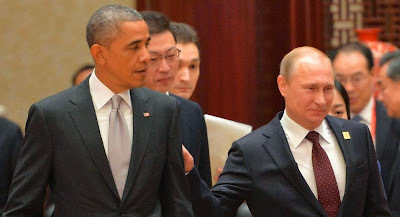 The tension over Ukraine increased media interest in any contact between President Barack Obama and Russian President Vladimir Putin as both men attended the Asia-Pacific Economic Cooperation (APEC) summit here. A White House spokeswoman confirmed that the two leaders spoke briefly on three occasions Tuesday and that they discussed Ukraine, as well as Iran and Syria. The spokeswoman said the conversations totaled 15 to 20 minutes, but did not provide any details on the exchange. When the two leaders were seen by reporters and cameras at a photo session Monday night, Putin walked in front of Obama and did not appear to speak to him. The White House official also seemed to express some frustration with Putin’s intransigence over Ukraine. “What Russia will find is, if they continue to do that, it’s a recipe for isolation from a broad swath of the international community,” Rhodes said. Nevertheless, the U.S. is not planning any special meeting at the APEC summit or other international meetings Obama is to attend in the coming days, such as another Asia-focused summit in Burma and the G20 meeting in Brisbane, U.S. officials said. “Our position on Ukraine is well known and is manifested in our sanctions and our policy,” Rhodes said. However, Rhodes said Obama will talk to Putin about the matter if the two have conversations on the margins of the APEC summit. In addition, Obama discussed Ukraine with Australian Prime Minister Tony Abbott in talks in Beijing on Monday and is likely to have conversations about the issue with German Chancellor Angela Merkel, the American official said. Rhodes said no when he was asked if the lack of evident U.S. response to the latest Russian moves indicated they were not that worrisome. White House aides also disputed claims that U.S. and European sanctions on Russia have fostered deeper ties between Russia and China, which recently announced new energy agreements valued at billions of dollars. “They didn’t get the best deal on the energy partnerships they announced,” Rhodes said of the Russians.